C.G. Boerner is pleased to present the first New York solo show of twin Swiss artists huber.huber, Mikrouniversum und andere kleine Systeme (Micro Universe and Other Small Systems). huber.huber (born 1975) graduated in 2005 from the Hochschule für Gestaltung in Zurich; in 2006 they won the Julius Baer Cultural Prize and a grant from the city of Zurich for a residency in New York (2006–2007). They have recently shown at Bob Gysin gallery in Zurich and their work will be featured in the publication Pilot 3 produced for this year’s Venice Biennale by the independent art forum Pilot London. Mikrouniversum comprises a large group of small-format collages and drawings with which huber.huber will transform the old master gallery of C.G. 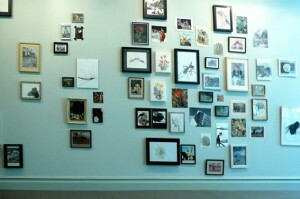 Boerner into a contemporary Wunderkammer. 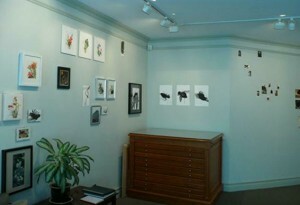 Fine pen and ink drawings of insects, birds, and other creatures will be juxtaposed with collages in which huber.huber playfully assemble a cosmos fraught with fabulous metamorphoses: using old photographs, pages from scientific books, and clippings from newspapers and magazines the artists transplant cut-out figures, animals, and insects to atmospheric natural settings like snowy mountains and mysterious canyons. huber.huber skillfully integrate the diverse fragments into their compositions and at the same time undermine traditional forms of both narrative and pictorial representation. In many of these works the figures find themselves not only out of place but also exposed, as fascinated observers or embattled antagonists, to oversize or even life-threatening insects and other creatures. Drawing the viewer into a realm of inversions and contradictions, Mikrouniversum becomes a humorous and satirical experience of the interplay between men and nature, of reality and pictorial construction. 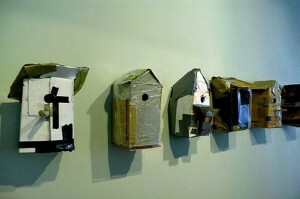 The installation Vogelhäuser (birdhouses) that will also be on view at C.G. Boerner, reflects huber.huber’s fascination for the hidden beauties and inconsistencies of everyday life. huber.huber’s birdhouses are effectively three-dimensional collages made of found objects and industrial garbage duct-taped together with apparently childlike simplicity. While the structures still serve their original purpose as temporary housing for birds, the artists have drawn the meticulous craft tradition from which they are derived into the realm of absurdity. Last fall, huber.huber created more than eighty birdhouses and installed them in New York’s East Village, the first project in the Swiss Institute’s “Hidden Track” series. In reference to hidden tracks on music records, this series features projects and installations that at first sight might not be detected as works of art by the casual viewer.